48003. Stream Corridor Restoration, Chapter 8a to 8e: Restoration Design, by FISRWG, 1998. 48004. Stream Corridor Restoration, Chapter 8f to 8h: Restoration Design, by FISRWG, 1998. 48005. An ecological characterization of the Pacific Northwest coastal region: Basic Concepts, by USFWS. 48006. An ecological characterization of the Pacific Northwest coastal region: Physical-chemical environment, by USFWS. 48007. Design of constructed wetlands: Chapter 3, by EPA. 48011. Sustainability of ground-water resources, USGS Circular 1186 (1999). 48013. Safe yield and sustainable development of water resources in Kansas, Kansas Geological Survey PIC 9 (1997). 48014. Sustainable development of water resources in Kansas. Kansas Geological Survey PIC Bulletin 239 (1998). 48019. "Why is the ocean salty? (Swenson, USGS). 48020. CV-SALTS: Central Valley Salinity Alternatives for Long-term Sustainability. 48021. Cal EPA: Salinity in the Central Valley: An Overview. 48022. USGS Techniques of Water Resources Investigations. 48023. Las Vegas: Gambling with water in the desert, in USGS Circular 1182 (2005). 48024. New River Wetlands Project. 48025. Performance Evaluation of the New River Wetlands Project. 48029. Stream Corridor Restoration, Federal Interagency Stream Corridor Restoration Working Group, 1998. 48030. U.S. Drought Monitor. NOAA/National Climatic Data Center. 48031. Federal Interagency Sedimentation Project. 48032. Investigating groundwater systems on regional and national scales. 48033. Methods for determining magnitude and frequency of floods in California, based on data through water year 2006. 48034. An assessment of carbon sequestration in ecosystems of the Western United States - Scope, methodology, and geography. 48035. USBR Water Measurement Manual. 48036. San Diego County Hydrology Manual. 48038. HEC-HMS Quick Start Guide. 48040. HEC-HMS Technical Reference Manual. 48042. NRCS TR-55: Urban Hydrology for Small Watersheds. 48043. Effects of land-use changes and ground-water withdrawls on stream baseflow, Pocono Watershed, Monroe County, Pennsylvania. 48044. Probable maximum Precipitation for California HMR58. 48045. Probable maximum Precipitation for California HMR59. 48046. Guide for selecting Manning's Roughness coefficients for natural channels and flood Plains (Arcement and Schneider: USGS WSP 2239). 48066. Applied Hydrology. Ven Te Chow, David R. Maidment and Larry W. Mays. McGraw-Hill Book Company, International Edition, 1988. 48080. Derailment of Amtrak Train 4, Southwest Chief, on the Burlington Northern Santa Fe Railway near Kingman, Arizona, on August 9, 1007., NTSB, Washington, D.C.
48081. Ground-water flow and simulated effects of development in Paradise Valley, a basin tributary to the Humboldt river in Humboldt County, Nevada, D. E. Prudic and Marc E. Herman, U.S. Geological Survey Professional Paper 1409-F, 1996. 48082. Hydraulic Engineering Circular No. 18: Evaluating Scour at Bridges, Fifth Edition, Publication No. FHWA-HIF-12-003, April 2012. 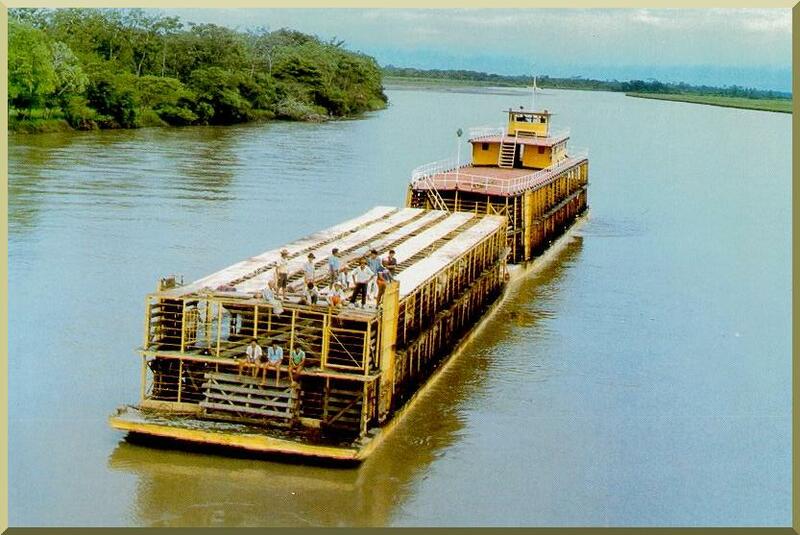 The Meta river, in eastern Colombia, navigable by local boats.